Noon, Gold Run Nordic Center, 200 Clubhouse Dr. This clinic works on techniques to make your skating as efficient, fast and fun as possible in any terrain. Ski levels can range from low intermediates who know they are skate skiing but maybe don’t even know the techniques’ name, to more advanced skate skiers looking to improve their V2. Fees: Member $18, Non-member $20. Ages: 14 and up. (970) 453-1734. 7-9 p.m., Colorado Mountain College, 107 Denison Placer Road. ‘Supervention’ was just listed as one of the top 10 films to see this season by Outside Magazine. Come see ‘Supervention’ at CMC Breckenridge in the Eileen and Paul Finkel Auditorium with giveaways from Voile, Swany and Kind Snacks. 9 p.m., Three 20 South, 320 S. Main Street. Funk, rock, electric energey. 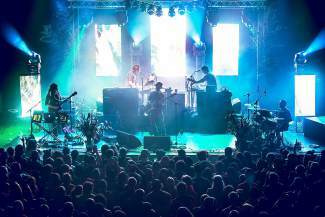 One of the fastest growing emerging artists in the jam and festival scene these days, Pigeons Playing Ping Pong is here to bring the party with their danceable electro-funk grooves and infectious ability to bring positive energy to any environment. 9 p.m., The Barkley Ballroom, 610 Main St. Hog Magundy is the most danceable bluegrass band to come out of Colorado since Leftover Salmon. Free show. (970) 708-7042. All day, t he U.S. Ski and Snowboard Association’s (USSA) under-18 slalom competition.